DUMBO — They'll know who to thank in their first Oscar acceptance speech. Ché Chisholm and Peter Vietro-Hannum — who have worked at HBO, MTV and on film productions including "Teenage Mutant Ninja Turtles," "Our Idiot Brother" and "The Savages" — recently launched Automatic Studios, a DUMBO moviemaking school that teaches kids everything from developing a script to editing and adding visual effects. 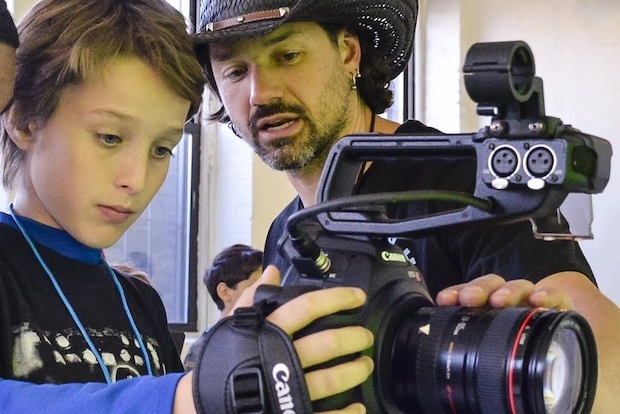 "We guide children through a complete moviemaking experience," said Chisholm. "They learn to pick up a camera, shoot, and edit but also other jobs on a film set like gripping, sound and electric." Automatic Studios is based in DUMBO's new Made in NY Media Center at 30 John St., where kids ages 8 to 14 have access to professional equipment, studio space and a private screening room. The company recently finished its inaugural nine-week after-school course, during which budding filmmakers worked together as a "creative production team" to make a short film that was screened at the media center. "Film schools often do not prepare students for the fact that they are one of many on a set," Chisholm said. "Making a movie is a collaborative effort, each person is a part of a working machine." Students also made commercials that allowed them to ride flying skateboards, hit home runs off of every pitch, turn violins into swords and invent magic pills designed to "get kids out of any sticky situation." "Kids have the imagination to make great films," Chisholm said. "We give them a green screen and they can go to the moon or China or anywhere they'd like." And the studio's waterfront location is nothing to balk at either. "Our spot is ideal," Chisholm said. "Every day we can explore the neighborhood and shoot on the cobblestone streets surrounded by industrial buildings. DUMBO has a very New York feel." Automatic Studios' upcoming afterschool session begins April 24 and costs $600 for nine classes. Week-long summer camp sessions start June 16 and cost $675. For more information, visit Automatic Studios.